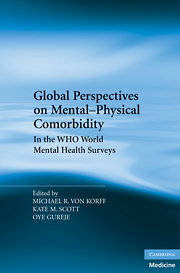 1 AMHES (Argentina Mental Health Epidemiologic Survey); SMHWB (National Survey of Mental Health and Wellbeing); ESEMeD (The European Study Of The Epidemiology Of Mental Disorders); NSHS (Bulgaria National Survey of Health and Stress); NSMH (The Colombian National Study of Mental Health); MMHHS (Medellín Mental Health Household Study); IMHS (Iraq Mental Health Survey); NHS (Israel National Health Survey); WMHJ 2002-2003 (World Mental Health Japan Survey); LEBANON (Lebanese Evaluation of the Burden of Ailments and Needs Of the Nation); M-NCS (The Mexico National Comorbidity Survey); NZMHS (New Zealand Mental Health Survey); NSMHW (The Nigerian Survey of Mental Health and Wellbeing); NIMHS (Northern Ireland Mental Health Survey); EMSMP (La Encuesta Mundial de Salud Mental en el Peru); EZOP (Epidemiology of Mental Health and Access to Care Survey); NMHS (Portugal National Mental Health Survey); RMHS (romania Mental health Survey); SASH (South Africa Health Survey); PEGASUS-Murcia (Psychiatric Enquiry to General Population in Southeast Spain-Murcia); CMDPSD (Comorbid Mental Disorders during Periods of Social Disruption); NCS-R (The US National Comorbidity Survey Replication). Most WMH surveys are based on stratified multistage clustered area probability household samples in which samples of areas equivalent to counties or municipalities in the US were selected in the first stage followed by one or more subsequent stages of geographic sampling (e.g., towns within counties, blocks within towns, households within blocks) to arrive at a sample of households, in each of which a listing of household members was created and one or two people were selected from this listing to be interviewed. No substitution was allowed when the originally sampled household resident could not be interviewed. These household samples were selected from Census area data in all countries other than France (where telephone directories were used to select households) and the Netherlands (where postal registries were used to select households). Several WMH surveys (Belgium, Germany, Italy, Poland) used municipal resident registries to select respondents without listing households. The Japanese sample is the only totally un-clustered sample, with households randomly selected in each of the 11 metropolitan areas and one random respondent selected in each sample household. Country Compare document: This document compares disorders across countries, listing among other things the hierarchies applied and whether the disorder was assessed in the Part I sample, Part II sample, or whether it was assessed at all.